Fits many Home Sewing Machines. 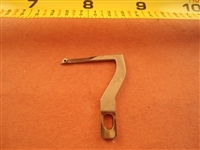 3-prong Electric Speed Control Pedal and Cord fits many Home Sewing Machines. Copyright © 2013 SewingPart.com. All Rights Reserved.